Wireless capsule endoscopy is a new technique for imaging the inside of the digestive system especially the small intestine that is inaccessible to many other diagnostic techniques. 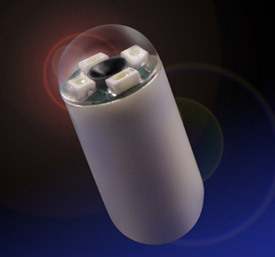 The capsule endoscope is a device shaped like a large pill that contains a camera and a radio transmitter. The patient swallows the capsule endoscope and normal digestive peristalsis caries it through the digestive system. Twice a second, the capsule takes a pictures of the inside of the digestive tract and transmits this picture to a receiver worn by the patient . These images can then be used to diagnosis conditions that have preciously been difficult to diagnosis conclusively such as Crohn disease cancer of the small intestine . Wireless capsule endoscopy is less invasive for the patient and requires less medical support making it potentially less expensive. The next generation of capsule endoscopes is already underdevelopment and starting to be used. One new model is a capsule endoscope that will be naturally digested if it does not pass through the digestive system in time. Other emerging technologies include a capsule that will propel itself through the digestive system, stopping to investigate abnormalities and capsule that can not only diagnosis but administer treatment as well.